Golmaal Again Movie Review. Forget Logic, Its all Magic! Diwali Dhamaka on way! Golmaal Again is the big Diwali release. Film has a star studded star cast of Ajay Devgn, Parineeti Chopra, Tabu, Arshad Warsi, Shreyas Talpade, Tusshar, Kunal Khemu, Prakash Raj, Neil Nitin Mukhesh, Johnny Lever, Sanjay Mishra. 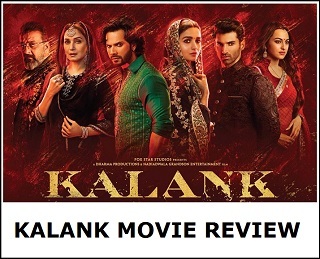 Film is directed by much celebrated film maker of today Rohit Shetty in his true blue style. Expectation is colossal from the film. Will it be able to live upto the huge build up? How is the 'Entertainment' quotient in the film. For, all these answers, let's do the Movie Review. 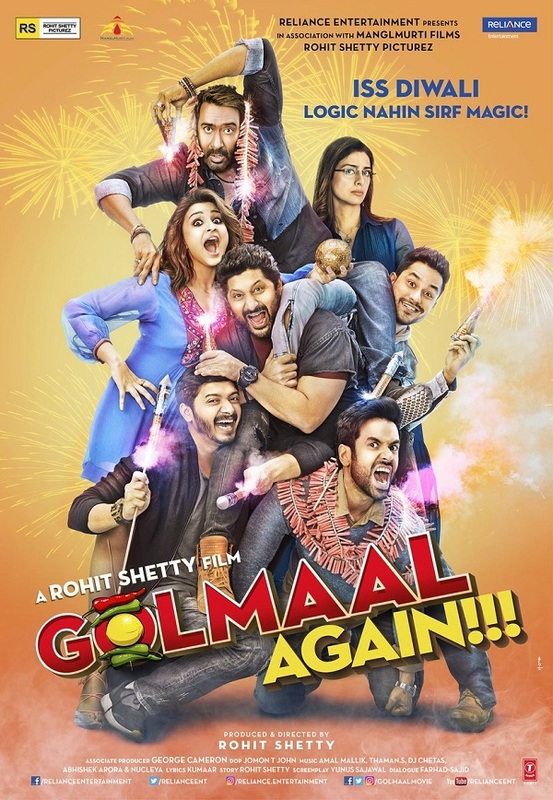 Story (Without Spoilers): Golmaal Again is story about two gangs who are unable to stand each other since their childhood and even after growing up. Gopal (Ajay Devgn) and Laxman (Shreyas) are the first gang, whereas Madhav (Arshad), Lucky (Tusshar) and Laxman (Kunal) are the other one. However, fate and destiny brings all these characters under one roof. There they meet Tabu and Parineeti Chopra. However, gang Gopal and gang Madhav don't know that the house they are staying is haunted by a ghost. When they realise about it, all hell broke loose. Film takes complete u-turn from here on. Actually there is a big problem which we simply can't tell right now because it will be a big spoiler. Will they be able to save themselves from this big problem? For that one has to watch the film in theaters. Golmaal Again first half is simply a complete Laughathon. From character introduction till the interval point it is all 100% Entertainment ride. There is simply no loo break. Main story unfolds from interval point and reach peak by the climax. There are dose of entertainment in 2nd half also. However, post interval film is more an emotional rollar coaster ride. Golmaal Again is no doubt a pure horror comedy film. But film has enough dose of human melodrama. In fact last 20-30 minutes of the film is quite emotional. 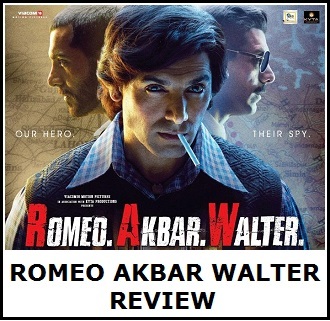 Direction of Rohit Shetty is simply superb and is of top notch. He is in full control of the film from start to finish. Golmaal Again is comedy masala entertainer from typical Rohit Shetty school of films. Rohit delivers what he promised. Big thumbs up to him. Film screenplay is just perfect. Film first half is simply outstanding. Second half is also good, but could have been shortened by few minutes here and there. There are numerous doses of LOL moment in the film. Golmaal Again promises to be a illogical masala horror comedy. And yes, it stays true to that. Just keep your brain at home, bring all your heart to the theater and it is guaranteed that one will have 2 and a half hours of power packed entertainment. Performances: Performances of all star cast of the film is simply fantastic. Ajay Devgn in role of Gopal is mindblowing. He fights like a Superman, but is terrified of Ghost. That is absolute hilarious to see. Arshad Warsi, Shreyas Talpade, Tusshar and Kunal Khemmu all add to the fun ride. These gang is simply unstoppable and all have added their own USP to the film. Tabu is sedate and is having much matured in the role of Anna. However, she also brings her own flavour. One simply can't forgot her recitation of tantra-mantra. Her over the top acting in that scene is absolute delight. However, main surprise package of the film is Parineeti Chopra. She owns the film. She is the main centrifugal force of the film and all rest characters revolve around her. A great welcome to Golmaal franchise. People will fall in love with her. Parineeti simply excels. Best performance of her till date. Johnny Lever as Bhoola, Mukesh Tiwari as Vasooli bhai, Sanjay Mishra, Vrajesh Hirjee, Prakash Raj, Neil Nitin Mukesh all add their unique colour to the film. All are excellent. Verdict: Golmaal Again is a complete hilarious adventure masala laughathon. Horror comedy is new in India and Golmaal 4 will definitely be the torch bearer in coming days for this genre. Film has fair share of thrills and action. It will fill audience hearts with laughter, joy and emotion. It is a film that will certainly make everyone laugh, cry and realise the importance of how beautiful life is. Golmaal Again is a complete entertainer which is apt for this Diwali. Yes, all age group from 5 years to 90 years will simply love it. Ratings: 4/5. Rohit Shetty and Ajay Devgn team is back. This Diwali no logic. It is all Magic as Blockbuster is written all over it. It is an attack at box office in coming days. 150 crore is Guaranteed. Question is whether film can challenge 200 crore or not. Diwali dhamaka, patakha and all on the way. Celebration begins finally!